The pink, plastic flamingo has managed to adapt, making every habitat its natural one. Don’t you wish all birds could? Each of my ornaments holds a good memory for me, too. There are the items that you’d expect on my tree: an ornament each for my two children, noting the dates of their births; a small, wooden house that celebrates the purchase of our first home; and because I live in Wisconsin, there are the requisite leaf ornaments and representations of black bears, cougars, elk and wolves and a variety of woodland birds. There are greyhounds and cats, for all of the pets that have shared their lives with me over the years. There are one or two ornaments a bit more inscrutable, such as a shiny, green pickle (honoring my German heritage). But there’s one ornament that stands out because it seems to have strayed very far afield from its natural habitat: what the heck is that gaudy pink flamingo doing here? What could this pink, tropical shorebird be doing on my Christmas tree in the Midwest? Actually, it turns out that plastic pink flamingos are a national phenomenon. They often turn up in places where, by nature, they shouldn’t—that is, as much as a plastic animal has a natural habitat. 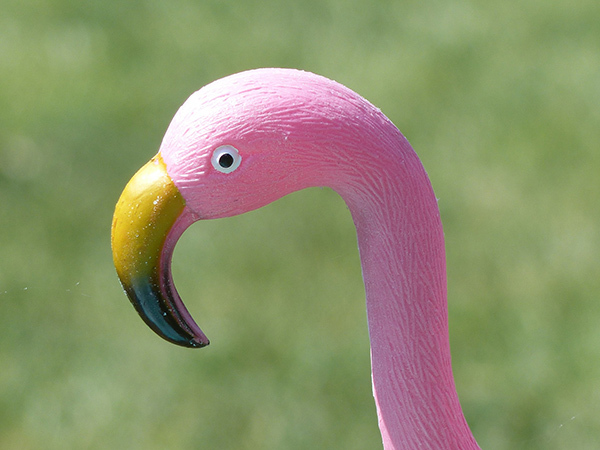 The plastic pink flamingo was invented in 1957, when a young designer named Don Featherstone rendered it for Union Products, a lawn-and-garden plastics company located outside Boston. Featherstone’s art tapped into a national fascination with all things Floridian at a time when middle-class tourism was booming. After World War II, families began en masse to take road trips; many of them to the Florida beaches. They drove back north with their cars brimming with knickknacks; porcelain palm trees and plastic flamingos. The fact that the state’s real flamingos had been hunted to extinction in the late 19th century for their plumes and meat didn’t seem to matter. At $2.76 a pair, the plastic birds were a cheap way to lend a bit of “nature” to manicured lawns. Flocks of plastic pink flamingos spread out across America in the 1960s. However, as with all “hot” trends, the birds then began to draw our ire. In a 1969 book titled Kitsch: the World of Bad Taste, author Gillo Dorfles called mass-produced lawn ornaments the epitome of vulgarity and the archetypal kitsch. But as the plastic pink flamingo rose to the top in poor taste, it also soared as an emblem of rebellion against propriety and elitism for a generation of Baby Boomer hippies. In fact, one of the greatest “pink flamingo events” happened in my hometown of Madison, Wisconsin. 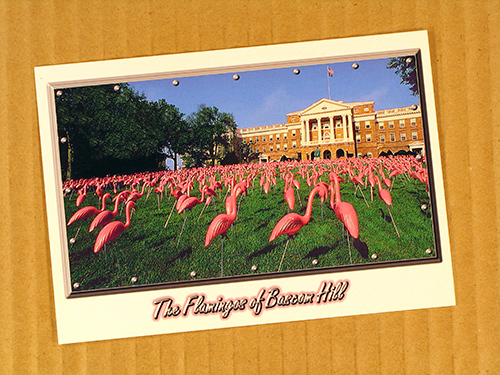 One early morning in 1979, thousands of plastic pink flamingos appeared on Bascom Hill, the university’s iconic landmark. Student government leaders of the Pail & Shovel Party (who also perpetrated the infamous “sinking” of the Statue of Liberty on the campus’s frozen Lake Mendota) had used student government funds to create the awesome sight. I, for one, am proud that the pranksters used an emissary from the natural world for attention. Even today, 31 years later, the postcard, which features a photograph of the event taken by Michael Kienitz, is a best seller on the campus’s world-famous State Street. In fact, the 1992 book If at All Possible, Involve a Cow: The Book of College Pranks by Neil Steinberg used a photo of the UW flamingos on its cover. Today, it can be said that the plastic pink flamingo is the crossroads of American taste, art and nature. 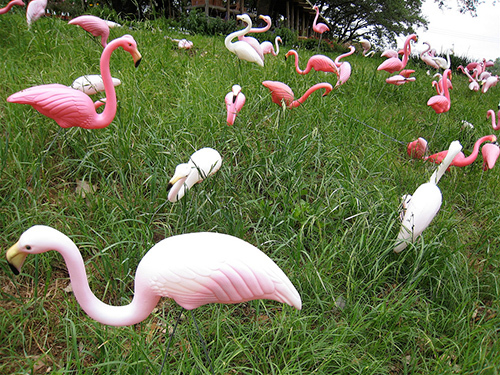 There’s a rumor that a 1990 poll conducted by American Demographics found that half the residents of Iowa thought pink flamingos improved a lawn’s appearance. I’m not sure I’d go that far, but I think I at least understand now why that bird perches on my Christmas tree every year. 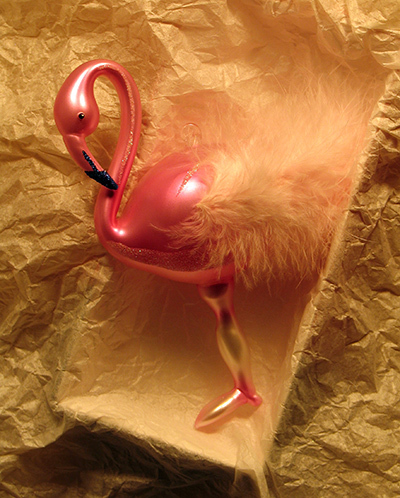 Like John Doe, the Everyman, perhaps the plastic pink flamingo is our Everybird. Instead of images of real whales or tigers or polar bears on our tote bags and water bottles—animals that some of us may never have the privilege to see—maybe we should be using a photo of a plastic pink flamingo. That animal may “speak” to us more on behalf of nature than any other token of the wild, since at one time or another, we’ve probably all run into one, “beautifying” the patch of nature closest to our front doors. So consider putting a pink flamingo on your tree next year, as well. Because despite the draining of our wetlands, the warming of our climate and the rapid loss of species every day, this bird has managed to adapt, making every habitat its natural one. Don’t you wish they all could? In what habitats have you encountered the plastic pink flamingo? If you could choose an animal spokesmodel to capture the world’s attention in support of wildlife causes, which one would it be? P.S. In doing research for this article, I found out that in 2009, the common council of the city of Madison, Wisconsin, designated the plastic flamingo as the city’s official bird. Our flamingos are the Genuine “Don Featherstone” design (with his signature), created in 1957 by Union Products in Leominster, Massachusetts. Unfortunately, Union Products closed in 2006, but the original molds for these classic pink 1950’s icons were purchased and are being used to produce them once again. Flamingo flock fund raising is an extremely effective event that has really taken off over the last couple of years. I have just returned from a stay in Miami Beach to attend a wedding and actually checked out the iconic plastic pink flamingo lawn ornament. It now costs $29.99. I didn’t buy one this trip, but may have to reconsider! Thanks for sharing this fun story. Groups of people have reintroduced the eagle, the wolf, the turkey and the elk in different parts of the country. Is anyone trying to reintroduce the flamingo in Florida? Is there anyone interested in doing that? If there is, I would like to know. The plastic flamingo, in the yard, could take on a new meaning. One that says, I support the reintroduction of the flamingo. I’d rather have the plastic Pink Flamingo than lawn gnomes. I have collected flamingos for years! lol And have one just like the ornament featured. I love the color, and they remind me of the beaches and warm weather. Now living in the Rockies in Montana, they bring wonderful memories of living on the beach in the East. My pink plastic flamingos stand around a fountain on a berm alongside the driveway. They share the area with several turtles of assorted composition, and with a stone rabbit. We’ve gotten some great comments. My husband made a sign for the area that reads “KITSCH,” (just in case someone thinks that the arrangement is serious). I love the whimsy! Long live the pink flamingo. We’ve always been drawn to things that are a bit odd or out of the norm. With that neck, those legs and the pink coloration, the flamingo is definitely odd. In front of a fire station near our house stand a couple of plastic flamingos, but they’re not pink. They’re painted white with black spots, like the standard fire-house mascot, the Dalmatian dog. Oddly, I’m totally fine with it being a pink flamingo.